He's one of European football's most recognisable sharp shooters, an in-form forward targeting a place in the UEFA Champions League final, yet for Bosnia and Herzegovina's finest, Edin Dzeko, it was in the Bundesliga with Wolfsburg that the powerful striker was catapulted to global fame. The current AS Roma hero was on fire as the Serie A side ousted Lionel Messi's Barcelona at the quarter-final stage of this season's European Cup. The 32-year-old registered goals in both legs as the Italians stunned their opponents by recovering from a 4-1 deficit in the Catalan capital to win 3-0 in Rome, a result that reverberated around the globe. Currently on 20 goals in 43 games in what is his third season with the Giallorossi (Yellow and Reds), Dzeko is reminding everyone back in Germany of the form he produced to help Wolfsburg become Bundesliga champions. "Joining Wolfsburg is going to help me, but now I have to learn German first." The famed words spoken by a 21-year-old Dzeko following his €4million move from Teplice - where he was named best foreign player in the Czech league - would prove prophetic. After his arrival in Lower Saxony in 2007, the 6' 3" striker quickly got to work on his language skills while his first moves on the training ground impressed the coach who first attracted him into the Wolves' den, Felix Magath. A return of eight goals in 28 Bundesliga outings was a modest outlay as the giant striker found his feet amid new surroundings with his club and the senior international side, for whom Dzeko made a goalscoring debut. With Wolfsburg finishing fifth and qualifying for the now defunct UEFA Cup, the stage was set for a newly confident Dzeko and his flourishing teammates to achieve an astounding feat in 2008/09. Surrounded by the likes of now legendary figures such as compatriot Zvjezdan Misimovic, Josue, Marcel Schäfer, Andrea Barzagli and fellow goalscoring phenomenon Grafite, Dzeko hit goalscoring heights hitherto unheard of for the player. As with Magath's finely tuned team, it took the striker time to hit top form that season - Dzeko only opening his league account on Matchday 7 against Schalke - yet once he did, the goals began to flow. In all, the Sarajevo striker bagged 26 goals in 32 Bundesliga appearances, while he smashed home 36 in 42 games in all competitions. Wolfsburg pipped Bayern Munich - against whom Dzeko scored a Matchday 26 double in a 5-1 victory for the Wolves - to win their first Bundesliga title, while the Bosnian narrowly missed out on the league's top goalscorer award. That went to teammate Grafite, with the Brazilian bagging 28 goals in the title-winning campaign to confirm the striking duo as the most prolific in Germany for over 35 years. The Torjägerkanone could wait, but it wouldn't be long. 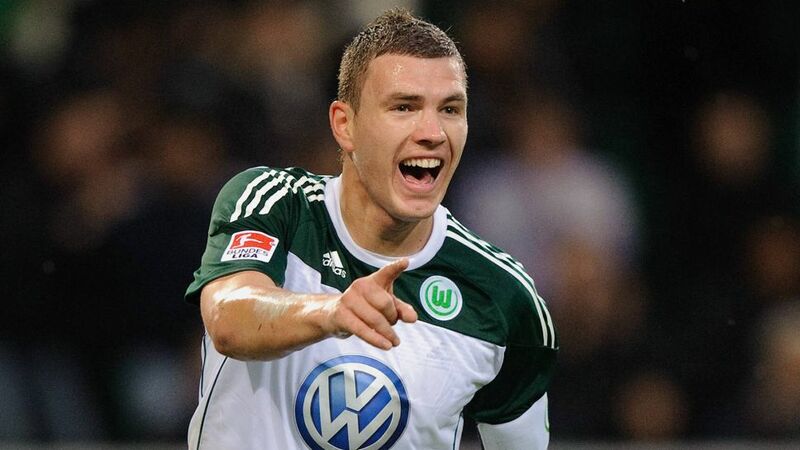 In the very next season, Dzeko scored 22 times and was thus proclaimed the Bundesliga's leading marksman for 2009/10. He also scored his first UEFA Champions League goal that same season, finding the target at Old Trafford as Manchester United earned a 2-1 win. Roma's current No.9 now has 14 goals in European club football's elite competition, adding tournament goals at Manchester City, the club he joined when his three-and-a-half season spell at Wolfsburg came to an end in January 2011. Leaving a lasting legacy at Wolfsburg - he is the club's all-time top scorer with 85 goals, 66 of which came in the Bundesliga - Dzeko's time in Germany will live long in the memory of all who witnessed his superb finishing and energetic displays. And as he now eyes a place in the UEFA Champions League final at the expense of Liverpool, the English Premier League giants will do well to beware the Bosnian with the heart of a wolf.